The Maplewood Lodge features 21 beautifully appointed rooms, featuring 42" flat-screen televisions, cable, free guest wifi, outdoor pool with deck, game room and coin-operated laundry. The motel opened in October 2014 and features an onsite full-service restaurant, complete with full bar. Maplewood Lodge offers 10 doubles and 11 singles on two levels. The motel is located conveniently on Route 5, right on the town line of St. Johnsbury and Lyndon. The newly renovated motel is centrally located to Burke Mountain Ski Resort, Lyndon State College, Lyndon Institute, St. Johnsbury Country Club and St. Johnsbury Academy. 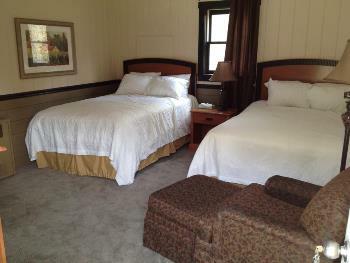 Operated by a couple who owns a local cleaning company, cleanliness is a top priority at the Maplewood Lodge. The site, constructed in the 1950s as a motor lodge, has been completely renovated from top to bottom, with every room receiving new beds, mattresses, comforters, pillows, furniture, lamps, televisions, air conditioners, rugs and much more. The bathrooms have also received complete renovations and feature granite-top vanities. All rooms are non smoking! NOW SERVING FOOD AT THE ICE LOUNGE & TIKI LOUNGE! The Maplewood Lodge is now open every day for breakfast, lunch and dinner. The menu includes breakfast sandwiches, omelets, hash browns, bagels, muffins, fruit, burgers, pizzas, hot subs, calzones, hot dogs, panini sandwiches, sandwich wraps, and french fries. A kids' menu is offered. Super fast take out! Delivery also available. Availability for private functions and parties. 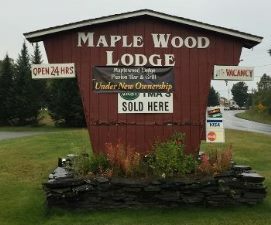 The Maplewood Lodge is located right on the VAST snowmobile trails, at Trail CA48, Junction 5/2F. Trails are groomed right to the parking lot, and TMAs are sold right on site! Small pets are permitted; a $100 deposit is required. Maplewood Lodge & Fusion Grille has been added to your trip.